Very nice and relaxing home. We spent 4 days at the Star Gazer. It is a very nice house with all that is needed for an enjoyable visit with family. Two master bedrooms gives the adults plenty of room, with grand-kids in other two bedrooms. The owner, Mimi, goes out of her way to help with your visit. Property is exactly as described. The amenities and extras are much appreciated. Mimi was responsive and went the extra mile to make sure we enjoyed our time in her home. Do not hesitate to book a stay at her property. Bald Head Island was beautiful. Perfect house for adult couples with children to stay for a family wedding. The family room is comfortable and spacious with enough porches to escape and listen to nature. The kitchen was large enough to cook a meal and everyone sit down to eat together. The outside grill is an added plus. The beautiful beaches are minutes away and a visit to Old Baldy Lighthouse is just a golf cart ride across the island. We hope we can come back next year and enjoy this beautiful island again! Great home, loved the upper front porch swing and rocking chairs. The home is spacious and we loved the reverse floor plan and that every bedroom has an attached full bathroom in addition to the 1/2 bath off the kitchen. Our Grandgirls loved the large jetted tub off the master bedroom and the beautiful ,spacious , shower. The kitchen is spacious and we took full advantage of the outdoor grill for most of our evening meal preparation. Having 2 golf carts for our use was essential since our family consisted of 6 adults and 2 young children. We had a great time biking, paddle boarding , hiking and sunning and swimming at the beach and at the Shoals Club. THe property manager Darren was very friendly and easy to contact. The owner , Mimi , was very cordial , responded quickly to our messages and was very helpful with suggestions on how to prepare for our trip and with answers for need to know questions for first time visitors to BHI. Everyone should experience the beauty of BHI. This home worked perfectly for our 2 families. It was well equipped, comfortable, the beds were great and there were lots of chairs and umbrellas for us to use. The golf carts worked well and the location was fantastic. The owners are very attentive and wonderful to work with. A wonderful vacation home!! gret hoise, very comfortable for our family of 6. Greg location. Comfortable house, well stocked with supplies and beach gear, bukes, etc. 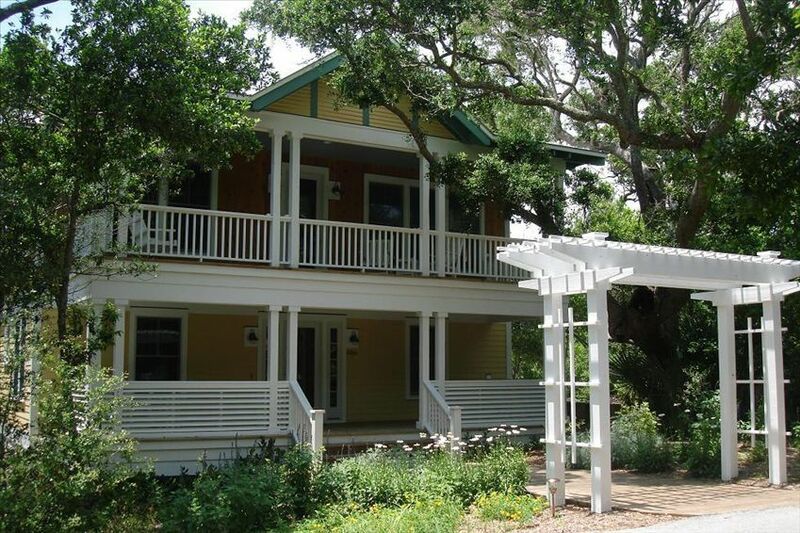 Nice convenient location near East beach and the Shoals club, but nestled in the maratime forest for a quiet spot. Very open and lightfilled filled space. Made for a vey enjoyable week for our family.